We have over two decades of experience in the plumbing industry as a family-owned and operated company because we believe serving you as a local customer keeps us in touch with your needs. Get immediate attention for your water heater troubles. If you need prompt repairs, you can depend on us to be there for you. We pride ourselves on providing an exceptional customer experience and want to ensure we continue to offer the local community with what they need most. We take the hassle out of finding the right contractor for all of your residential or commercial needs. We have 20 years of experience in the industry providing affordable solutions for all plumbing and water heater needs. Call us at 269-673-3651 or email us. 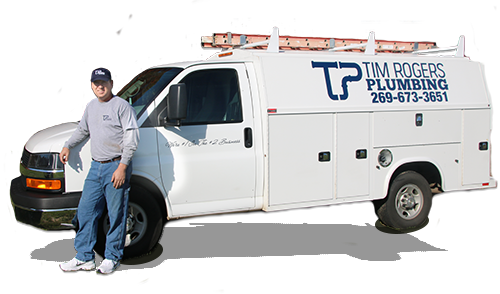 Tim Rogers Plumbing LLC serves the Allegan, MI area. Local towns include Otsego, Gobles, Bloomingdale, Fennville, Grand Junction, Hopkins, Hamilton, and Plainwell . Sewer gas was filling my home after a 1 week snow storm. My heat stopped working on one of the coldest days of the winter.